Eme got a lot of presents for her birthday. 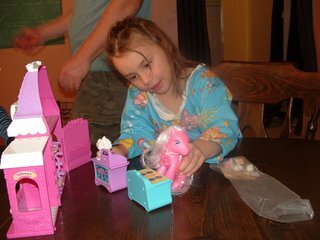 She got 4 big My LIttle Ponies, 10 or so little ones, a Care Bear checkers game, a Little Pets shop, a My Little Pony Cotton Candy shop, 2 stuffed Care Bears, a new dress, a new Care Bear jammie dress, a Barbie plate, a Strawberry Shortcake puzzle, a little porcelin tea set, and some small princess dolls. Thats enough toys for 3 kids! She was so pleased.